Europe Geogrids Market size was over USD 310 million in 2017 and industry expects consumption above 310 million square meters by 2024. Rising number of infrastructure projects owing to increasing investments and economic recovery will drive Europe geogrids market demand. These products exhibit high lateral restraint, good tensile strength, and load-bearing capabilities which makes them suitable for construction sectors. Increasing construction spending mainly in Germany, UK, Poland, and Russia owing to rising public infrastructure projects such as rails, bridges, harbors, roadways, and airports is likely to fuel product demand. Construction practices and pavement designs need high quality materials to fulfil various infrastructure standards. Supportive EU legislation and increased funding efforts have improved railway industry competitiveness which is likely to rise environmental awareness, thereby increasing transportation desirability. European construction industry grew at over 2.5% and 3.5% in 2016 and 2017 respectively. 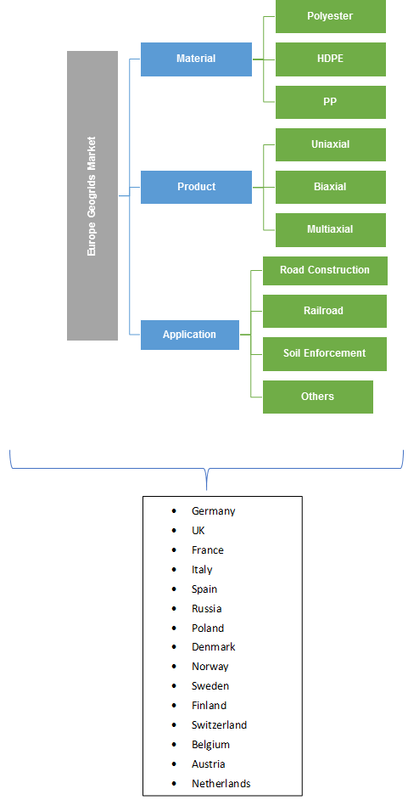 Europe’s road infrastructure market is likely to grow significantly at over 15% in the future timeframe on account of strengthening economy, rising investment and jobs, primarily led by UK, Norway and Poland industry growth. In July 2017, the UK Government approved construction contracts which was valued at over USD 8.5 billion for the High Speed 2 rail infrastructure project, which may stimulate geogrid demand pertaining to the reduction in ballast deformation and tracking of settlement and maintenance costs. Growing demand in environmental projects mainly dealing with slope protection and erosion control should drive industry growth. Europe soil erosion exceeds USD 1.45 billion annually and affects over 10 million hectares of agricultural land. Soil erosion can decline crop productivity, damage plantations, and increase fertilizer costs. Geogrids are increasingly used to minimize erosion damage and impart permanent protection & slope stability in hillsides, embankments, and stream & river banks. Growing consumer awareness regarding product applications for flood-prone areas in addition to their eco-friendly nature will further accelerate Europe geogrids market growth. HDPE, polyester and polypropylene are the key raw materials used in production process. PP is preferably used ingredients owing to its cost effectiveness, chemical and pH range resistance. Geogrids are damaged during material creep, exposure to climatic conditions, mainly UV light and low temperatures, and installation process may hinder Europe geogrids market demand. The degree of damage varies with temperature at the site during installation which may further restrain industry growth. Polyester based Europe geogrids market size should register gains close to 4.5% by the end of forecast period. They have excellent heat resistance, high mechanical & chemical stability, resistance to ultraviolet & biological degradation and strong tensile strength which in turn enhances ground bearing capacity. Technological advancement in construction sector with rise in infrastructure spending should have a positive influence in Europe geogrids market demand. Europe geogrids market from HDPE is poised to exceed USD 140 million by 2024. It has wide application usage in construction, reinforced retaining walls and slopes. They are mainly ideal for soil enforcement due to their interlocking action and strain compatibility. It is tested to maintain high strength junction, tensile modulus and also increases durability against installation damage. Europe uniaxial geogrids industry size was valued at over USD 185 million in 2017. These products are used in reinforced retaining walls construction with varying frontages, long-term load-bearing structures, scarp, and landslide damage repair. High longitudinal tensile strength, low maintenance, rapid construction, and versatility are key attributes accelerating industry growth in the region. Europe biaxial geogrids market share may account for about 20% of the total demand by 2024. These products find use in subbase reinforcement, soil stabilization, foundation engineering, and highway construction applications. Their beneficial features such as high tensile stiffness, excellent durability, and stretch resistance may favor product demand. 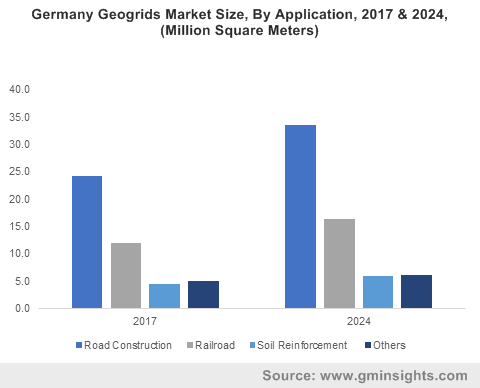 Europe geogrids market size from road construction is predicted to surpass USD 235 million by 2024. These products are used in construction of heavy load-bearing roads, port areas and airports. They improve load-bearing capacity, road safety, surface quality and reduce maintenance costs which further stimulate industry growth. Europe geogrids market demand from soil reinforcement is likely to witness gains of about 3.5% during the foreseeable timeframe. These products are used in retaining walls, steep slopes and soft soil reinforcement owing to their relatively high tensile strength, improved rail safety, high temperature stability and excellent UV, chemical, abrasion and biological stability. UK geogrids market size is predicted to witness gains at over 5% up to 2024 owing to increasing civil engineering projects, such as rail infrastructure development. Additionally, increasing erosion damage on England’s southern coast are primarily stimulating product demand. High-flood risk of England and Wales has led to increasing demand for sustainable urban drainage systems which may enhance regional market share. Italy geogrids industry size is likely to exceed USD 50 million by 2024. Changing government attitude toward FDI has boosted investment in commercial & residential construction sector. In addition, high water and coastal erosion damage in several places such as Civita di Bagnoregio and Marche region are likely to accelerate regional demand. France geogrids demand may witness significant gains over the forecast timeframe. Potential rehabilitation of road and rail network infrastructure accompanied with companies upgrading construction projects benefitting to various application industries. Europe geogrids market share is moderately fragmented with top five companies catering to over 80% of the total market demand in 2017. Koninklijke Ten Cate, Solmax GSE, TENAX SPA, Tensar International Corporation, and Huesker Synthetic GmbH are the major industry players in the industry. Manufacturing companies are focusing on innovative strategies to facilitate product development or enhancement to obtain competitive edge. Companies are highly engaged in acquisitions to enhance product offerings & capture the market and in distribution agreements to increase market penetration & reduce costs. They are used in the construction segment as a reinforcing substance for roads, retaining walls, and steep slopes on account of their greater load-bearing capacity, erosion control, and durability. They are manufactured either by weaving polymeric fibers together, or by punching holes in sheets, followed by stretching in various directions. These products have high tensile strength and load-distribution ability which increases their suitability for infrastructure activities. These products are majorly utilized by the road, railway, commercial & domestic construction, and airport applications. Rising awareness for enhancing the overall strength, safety and cost minimization of load-bearing structures is expected to accelerate Europe geogrids industry demand.